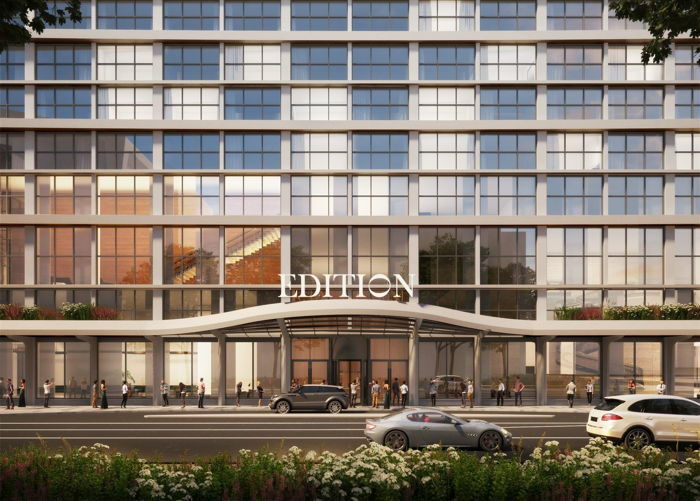 Strategic Property Partners, LLC last week announced plans to bring Marriott International’s brand, EDITION, to Tampa. The 173-room hotel will be part of a 26-story tower in the heart of the Water Street Tampa neighborhood, which will also feature a newly built JW Marriott planned to open the prior year. Created through a partnership between innovator Ian Schrager and Marriott International, the brand currently has hotels in New York, Miami, London and Sanya, China, with seven new properties across three continents scheduled to open in 2018. Designed by Morris Adjmi, the Tampa EDITION is the acclaimed New York-based architect’s first commission in Tampa, among a handful of past projects in Florida. Morris Adjmi is working in collaboration with Nichols Brosch Wurst Wolfe & Associates, a Florida-based architecture and planning firm. Paired with interiors designed by Roman and Williams, known for designing stunning spaces around the world, the Tampa EDITION will offer multiple social and amenity spaces for guests and residents to enjoy, including a rooftop pool with adjacent bar and restaurant as well as an expansive spa and fitness center. Anchoring the ground floor will be a selection of carefully curated restaurant and retail spaces that have been programmed by the Ian Schrager Company, highlighted by a high-end restaurant that will activate the streetscape and draw visitors from surrounding neighborhoods. SPP recently announced that it will introduce Marriott International’s JW Marriott luxury brand to Tampa in 2020. SPP is also investing to fully renovate the existing, 727-room Marriott Waterside Hotel & Marina. Combined, the JW Marriott and Tampa Marriott Waterside Hotel & Marina will create the largest collection of hotel rooms and meeting space in the Tampa Bay area with 1,246 rooms and 150,000 square feet of meeting and event space. The renovation of the Marriott Waterside Hotel & Marina is expected to be completed Spring 2019, and construction of the JW Marriott is slated to begin in April 2018. Together, the three hotels will play a key role in the Water Street Tampa neighborhood masterplan. Water Street Tampa, one of the largest real estate developments in the United States located within an existing central business district, is a multi-phased urban development project that includes more than 9 million square feet of commercial, residential, hospitality, educational, entertainment, cultural and retail space, with the first new buildings breaking ground this year.